← Holiday Recipe~Grandma McAfee’s Blackberry Cobbler! Now we are talking my lingo. Chocolate. Mmmm. This recipe was submitted by my claimed sister Amber Looney!! One of my 90+ year old ladies said that I stole her grandmas recipe. Best compliment ever. So the recipe is a keeper lol. Combine dry ingredients in a sauce pan. Blend in evaporated milk and vanilla. Beat egg yolks then stir into mixture. Heat stirring constantly just until butter is melted. Bake for 35-40 minutes or until pie is not “wobbly” when shaken. 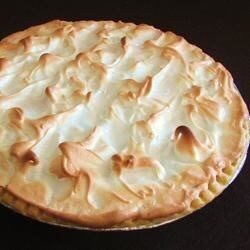 Return to oven and bake until meringue is golden. Mmmmm chocolate makes me happy! This entry was posted in Blog, Family, God, Holidays, informational, inspirational, Recipes and tagged chocolate pie, Christmas, Holiday Recipes, Thanksgiving. Bookmark the permalink.